After the firing of head coach Kirk Earlywine (and his career record of 42-78), it shouldn't have been a surprise that some players might transfer out. Even at Arkansas, which had likely the most applauded hire of the offseason (with Mike Anderson), their best player, Rotnei Clarke, transferred out. So it's no surprise that they had a high number of transfers. - Glen Dean (EWU) - After initially saying that he would stay and play for new coach Jim Hayford, he apparently changed his mind, and will transfer to Utah. There he will sit out a year, and have 2 years of eligibility remaining. First, the bad news. He was the best player on the Eagles last year, finished 2nd team all Big Sky, and would have been one of the top candidates for POY in the Big Sky. He had a nice assist rate, cut down on his turnovers, and shot 42% from downtown (though just 36% from 2s). He would have been the biggest building block for Coach Hayford. Now, the good news. 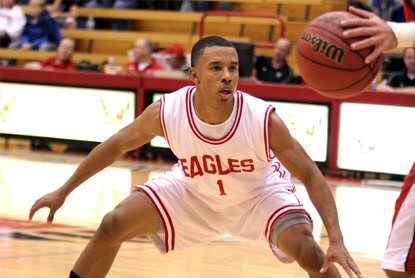 EWU is very deep in the backcourt, and should be able to recover pretty well. Cliff Colimon will be a senior, and he score in a variety of ways (27 points in the Big Sky Tourney game last year). He was second on the team in assist rate, though they will need him to be a better distributor. Kevin Winford is probably the least known player to have scored 39 points in a single game last season. Jeffrey Forbes played almost 80% of the team's minutes last season and shot 90% from the FT line and 41% from 3PT. In addition, Willie Hankins redshirted last season, and Eastern Washington folks are very excited about his potential. Wing man Collin Chiverton was a top 150 recruit out of high school, and should be in the running for Newcomer of the Year in the Big Sky after a successful JUCO career. Losing Dean will hurt them, but they should be able to make do just fine with all that backcourt talent coming back. - Rashano McRae and Carter Warnock (EWU) - Word came out that these two were going to be "exploring options in Division II and National Association of Intercollegiate Athletics basketball teams." McRae played in 23 games as a junior (his first year), but had very minimal impact. The 6'7'' McRae scored only 21 points with 29 rebounds in 175 minutes of action. He played double digit minutes in his first four games, and then only 3 times for the rest of the season, so it should not be a huge loss, especially with the signing of JUCO F Jordan Hickert. I don't believe McRae has decided where he will go, or at least I have not seen anything. Warnock was 6'9'' and redshirted his freshman year before deciding to leave with the coaching change. He is tall but thin, and likely would not have made a major impact for the team next season, despite a thin frontcourt. He transferred to Point Loma, which, if you hadn't heard of that university before right this moment, you are not alone. I think with Autry’s athleticism and strong defensive skills will make it tough for him not to be in the mix for playing time next year. I think his skills will fit the needs the Griz will have next year. If he could develop a consistent three point shot it would be a lock. I'm sure Wayne Tinkle would have liked to have kept Autry around, but they should have the depth to overcome his departure. - Casey Trujeque (Montana St) - This is another case of a player from California transferring to be closer to home. At 5'9'', Trujeque struggled to find his own shot as a freshman (shooting under 30%), but looked to have a nice future as a playmaker. He had an Assist Rate of 26.8, which is very solid, and was third on the team in assists despite playing about 9 minutes per game. He likely would have seen an increased role next year, and could have been starting by his junior year, so his loss will be felt in the Bobcats program. - David Arnold (Northern Colorado) - After two seasons, Arnold decided to transfer to MSU-Billings for his final two years. The CO native was not a big factor for the Bears, playing in only 9 games last year (after 21 as a freshman), and scoring 20 total points in his 2 seasons. While it is possible he could have earned more playing time, I can't imagine the Bears coaches are too broken up about his departure.